Only Unit Of Its Kind In This Trendy Boutique Building Boasting A Huge (Almost 300 Sf) Terrace W Unobstructed East Views!In The Spacious & Welcoming Foyer Eyes Are Drawn Immediately To The Spectacular City Views. Extra Wide 1+1 Floor Plan W Open Concept Living /Dining/Kitchen Area Has A Wonderful Flow Great For Entertaining. 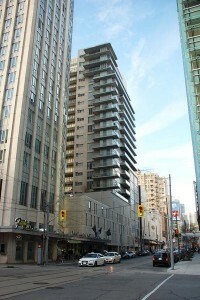 1.5 Baths & 2 W/O’s To Terrace.Ultimate In Urban Chic & Location, Steps From Yonge/Dundas Square, Ryerson, Eaton Centre, Theatres, Massey Hall, St.Michael’s Hospital. 1 bedroom + den, 2 bathrooms, with 1 parking space, and 2 lockers. Contact me, for a private viewing.